The draining of oil spill shipwreck off the coast of Bulgaria’s Sozopol began on 12th of September. 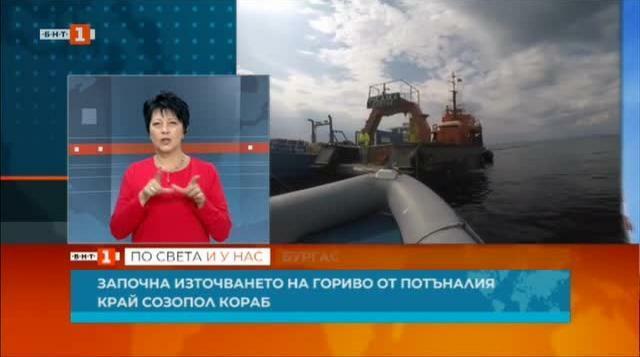 The Director of Maritime Administration, Captain Zhivko Petrov, told BNT that the first 10 cubic meters of water-oil mixture was drained into the Rusalka oil tanker. The draining operation has been temporarily stopped because of worsening weather today and tomorrow. It is expected that at the end of the week, weather permiting, divers will descend to the sunken ship and the oil drain will continue. Work to begin the draining on the Mopang ship began a few days ago, after several postponements because of weather conditions..
On September 10, the strong north-east wind did not allow diving teams to go underwater. Mopang was a US cargo ship which sank on 30 June 1921 after hitting a mine near the port of Burgas, near St.Ivan island. In August 2018, it was found to be the source of heavy fuel oil leaking from it.